Indian sand artists Sudarshan Patnaik is known for his incredible coastline compositions of temples and other sacred imagery. Now with the support of Greenpeace, the artist is taking his sand art and using it as a work of activism to highlight the impact of global warming. 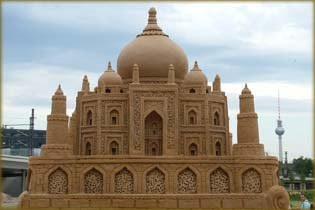 The artist created miniature sand sculptors of famous heritage sites, including; the Jagannath and Konark Temples in Orissa, the Shore temple in Tamil Nadu and the Gateway of India at Puri in Orissa. Seven tonnes of sand were used over two days to complete the work.